Beautiful picture!! I promoted via Twitter. Cactus Wren The Cactus Wren is the largest North American wren, at 18-23 cm (7.1-9.1 in) long. 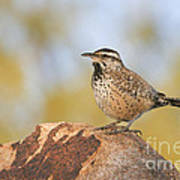 Unlike the smaller wrens, the Cactus Wren is easily seen. It has the loud voice characteristic of wrens. 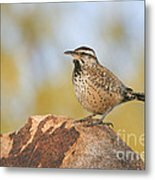 The Cactus Wren is much less shy than most of the family. Its marked white eyestripe, brown head, barred wings and tail, and spotted tail feathers make it easy to identify. Like most birds in its genus, it has a slightly curved bill. 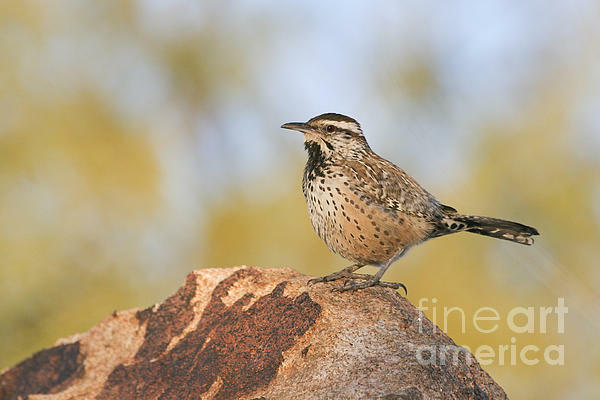 There is little sexual dimorphism.The Cactus Wren forms permanent pair bonds, and the pairs defend a territory where they live all through the year.Chosen to be the Arizona state bird in 1973.